Will a pineapple ripen after being picked? Nope. Once it's off the pineapple plant, this fruit won't continue to ripen. However, while its sweetness doesn't increase, and its flavor doesn't improve over time, its texture does change – the flesh of the pineapple continues to soften after harvesting. This isn't ripening, though; technically, it's the start of the process of rotting, but the pineapple certainly isn't spoiled or unsafe to eat in the early stages of softening. 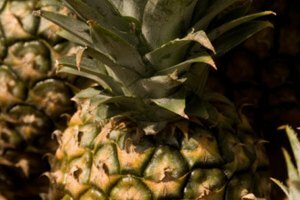 Because the pineapple ripening time is over once it's harvested, growers are careful not to pick them until they're ripe; often, sugar levels are tested for certainty. 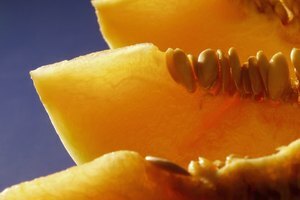 The rinds go from green to yellow, and pineapples may be ripe at any point during these phases of coloration. If you choose one with a uniformly yellow rind, there's nowhere left for it to go but downhill after several more days at its peak. However, if you pick one with a green rind, you have a little control over how quickly it will turn yellow and the fruit will get a bit softer – but again, not any sweeter or more ripe. 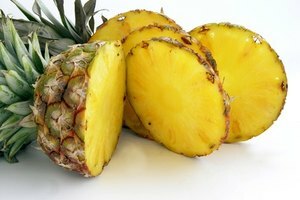 This yellowing and softening process occurs faster if you store the pineapple whole at room temperature rather than in the refrigerator, but keeping it on the counter will also shorten its shelf life. Once the rind passes from yellow into the realm of gold or brown, the fruit is rotting and should be discarded. A fresh, whole pineapple stored at room temperature typically lasts around two to three days. Storing it in the fridge, which slows the yellowing of the rind and the softening of the flesh, generally extends its life to more like four or five days. Make sure the pineapple is firm but not rock solid. It should give a little with a squeeze, but shouldn't be soft or squishy. The bottom of the pineapple should smell nice and slightly sweet. If it doesn't have any smell, or if there's a vinegary or otherwise unappetizing odor, don't take that one home. All the leaves sprouting from the top should look healthy, firm and green, not brown, dried-out or wilted. While they shouldn't just be falling out, it's a myth that you can determine a pineapple's ripeness or quality by how easy it is to pluck out the leaves. Pass up any pineapple with visible damage, rotten or bruised spots, mold growth or liquid excretions. Choose the largest pineapple that passes inspection. Size isn't an indication of ripeness, sweetness or quality, but the bigger it is, the more edible flesh there is. As is usually the case with fresh fruit and vegetables, pineapples hold up longer when left intact. Once they're cut, remaining pieces should be kept in an airtight container in the fridge. They'll last three or four days, but they'll start to turn brown. You can slow this process, called enzymatic browning, a little by lightly coating the pieces of pineapple in orange or lemon juice. Cut pineapple is eligible for freezing, but whole ones aren't. Frozen food stays safe to eat indefinitely, but its quality declines, so preferably use frozen pineapple pieces in under six months. If you don't want to end up with one big chunk of frozen pineapple, spread the pieces out on a baking tray in a single layer without any pieces touching each other. Freeze them like this first, and then package the frozen pieces in an airtight container or freezer bag. If you can vacuum seal, that's always good, or press as much air out of the bag as you can while closing it.